A highly-detailed and advanced kit in the 1/24th scale range, this model of one of the world's most technically advanced war planes does full justice to the type's versatility as a vertical take-off and landing combat aircraft. 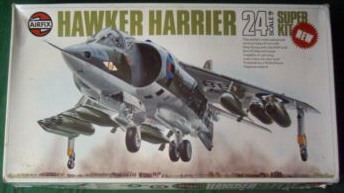 Movable control surfaces, a retractable undercarriage, a cockpit scaled down from the real thing, a fully detailed and accessible Pegasus engine and optional weapon fits - all these and more are distinct features of this kit which has more than 280 parts. Two sets of markings are included, one for an RAF aircraft and the other for a US Marine Corps aircraft - designated by that service as AV-8A.